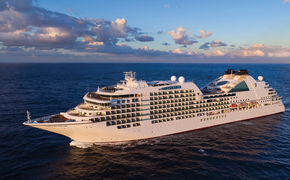 Silversea Cruises has added 25 new voyages in Northern Europe and the Mediterranean to its $1,000-per-suite onboard spending credit offer, bringing the total to 38 sailings worldwide. And, more than 25 voyages now offer a $500 per suite onboard spending credit. These offers are good on new bookings made by June 30. • Northern Europe Voyage 1117: Silver Cloud, June 15 to 25, Barcelona to Southampton, with calls in Palma de Mallorca, Ibiza, Cadiz, Lisbon, Oporto (Leixoes), La Coruña and Saint-Malo. Silver Savings fares start at $5,118. • Northern Europe Voyage 1120: Silver Cloud, July 20 to 30, Southampton to Copenhagen with calls in Plymouth, Jersey, Rouen (overnight visit), Honfleur, Oostende and Antwerp. Silver Savings fares start at $5,278. • Mediterranean Voyage 2123: Silver Wind, Aug. 9 to 20, Athens to Barcelona with calls in Mykonos, Rhodes, Santorini, Milos, Malta, Trapani, Sardinia and Palma de Mallorca. Silver Savings fares start at $6,038. • Mediterranean Voyage 5123: Silver Spirit, Aug. 13 to 20, Venice (overnight visit) to Rome, with calls in Hvar, Dubrovnik, Taormina and Sorrento. Silver Savings fares start at $4,718. • Northern Europe Voyage 1122: Silver Cloud, Aug. 16 to 26, Copenhagen to London, with calls in Szczecin, Rostock, Skagen, Oslo, Amsterdam, Oostende and Honfleur. Silver Savings fares start at $5,278. • Mediterranean Voyage 5129: Silver Spirit, Sept. 30 to Oct. 7, Athens to Monte Carlo, with calls in Malta, Taormina, Sorrento, Rome, and Elba. Silver Savings fares start at $4,438. All fares are per person based on double occupancy for a Vista Suite and do not include port charges and handling fees that can range from $175 to $275 per person. Silver Savings is a capacity-controlled program and subject to availability. A free roundtrip economy air package that includes transfers between airport and pier on the day of embarkation and disembarkation is available from 22 cities in the U.S. and Canada. It is a capacity-controlled program offered for a limited time. Additionally, there are specially priced air programs available from another 50 cities. For a complete list of voyages offering the onboard spending credit, visit www.silversea.com/specialoffers.